Alexandre Desplat is the star of this urgent, thrilling denouement of the Potter saga. And neither he, nor anything he created or contributed to the film can be seen. Almost everything in Deathly Hallows 2 is the best in the series: acting, atmosphere, cinematography, direction and editing. But the star of this moody, broody, menacing conclusion to JK Rowling’s 7 book, 8 film narrative, is the music. Desplat’s original, superb score perfectly complements Eduardo Serra’s dark, evocative cinematography. Having got two of the best in the business David Yates, confident in his 4th film in the franchise, makes superb use of them, ensuring music, cinematography, editing and design, all, as they should, unobtrusively drive Rowling’s sinister narrative to its complex but suspenseful conclusion. Best? Desplat has been nominated 4 times for Oscars: The King’s Speech, Benjamin Button, The Queen, The Fantastic Mr Fox. Aside from these he scored 2 brilliant French films: A Prophet and The Beat That My Heart Skipped. Thanks to his always effective but never intrusive, score for DH2, this is easily the most accomplished of the series in which early episodes were sometimes uneven in tone and pace. Serra is no slouch either with a track record that includes Girl With The Pearl Earring and Unbreakable. I single out Desplat and Serra simply because their expertise raises the sheer cinematic quality of DH2 above the rest, though as ever Set and Art Direction and the imaginative special effects are as good as they have always been in this series. There has always been an embarrassment of acting talent in the Potter films: Maggie Smith, Michael Gambon, Ralph Fiennes – here superb as Lord Voldemort, Rickman, Hurt, Bonham Carter – the list is almost endless. And at last, perhaps for the first time, our intrepid trio of Harry (Daniel Radcliffe), Hermione (Emma Watson) and Ron Weasley (Rupert Grint) look comfortably at home amongst the intimidating depth of experience and ability around them. Their natural, instinctive but slightly gauche playing early on in the series worked well enough for the age and stage of Rowling’s narrative. But as we’ve watched these three grow up physically on camera, their increasing assurance and comfort in character and on camera reaches a pretty decent level in their last film. The emotionally darker tone of DH2 needed them to rise to the challenge and to their credit they do. One can hardly imagine a better apprenticeship in cinematic acting than the immensely supportive and profoundly talented actors and technicians with which they have had the privilege to work over 8 films. Fortunately all three appear to have had the good sense and humility to watch, listen, learn and take direction. It certainly pays off with their characterisation in DH2. I will not begin to try to deal with Rowling’s literally infernally complex and assiduously detailed plot: if you know the books you don’t need it and if you don’t you’ll just have to take it all at face value as I did. While I still have some loose ends for my Potter-addict daughter to tie up, I feel less bewildered this time than after all the previous films. One basic fact that may help my fellow Potter virgins: a horcrux is a magical object, animate or inanimate that can be used to house part of a person’s soul; thus making it possible for the creator of the horcrux to survive even if he himself is destroyed. Lord Voldemort has created 3 horcruxes for himself which accounts for why he is almost impossible to kill. The search by the intrepid chums for these horcruxes so that they can first be destroyed to render Voldemort mortally vulnerable is pretty much the narrative drive of DH2. There are special historical reasons, one chillingly problematic, why Harry is necessarily Voldemort’s nemesis. There has been no shortage of talent, technical and creative in the other 7 films but for my money these are all beautifully drawn together here by Yates and given a kind of narrative spine by Desplat’s and Serra’s superb work such that DH2 doesn’t just have pace but a satisfying cadence, where there is a steady, cumulative build up to moments of explosive or quietly sinister and menacing drama. It’s as if everyone on the series project has learned and improved episode by episode for it seems to me that this time even Steve Kloves’ screenplay is leaner, cleaner and less cluttered with plot exposition than on previous films. This is only partly due I think to the undeniable fact that much can be taken for granted plot-wise at the end. While there are elements of the narrative I need to consult my Potter Oracle about – I think I got the gist enough to enjoy this thoroughly enjoyable film to the full. Whatever else we may say, I think Rowling must agree that a vast army of talented people has finally done more than justice to her world-beating narrative vision. This is neither an innovative nor groundbreaking film: for it occupies different aesthetic and commercial territory; but it is a superbly accomplished, utterly professional one at all levels and great entertainment for all ages. I intentionally saw this for the first time in 2D. This is because I have some issues with 3D that I hope to write about at some stage. However it is clear that the way the film is shot will more than deliver on the novelty experiences characteristic of the current aesthetic use of the stereoscopic process. 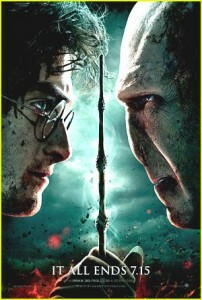 Deathly Hallows Two should leave Potterites fully satisfied and the rest of us throughly entertained.